This Monday we ended our fantastic class with our portfolio presentations describing our semester-long projects. Elaine, Harina, and I were able to present to the class our GlassFlex design. I knew from the beginning of the semester a lot of people didn’t really understand our concept, nor did they think it would be useful in comparison to what other people were creating. But I was very pleased with the responses we got from everyone, such that not only would people be willing to use the product but actually purchase it as well! The idea stemmed from a brief discussion at the beginning of the semester about the power of the Maker Movement, in finding small and subtle solutions to every day problems based off of what we could come up with in our heads. We were shown previous things that former students in the class had made. One that really stuck out to me was the dynamic door stopper, that could hold the door open at any angle. This idea wasn’t as glamorous as building an artificial intelligence robot or anything having to use arduinos period. But I felt a connection to this idea that it was something you didn’t even know you needed until you realized you were living without it. This shaped how I thought about what my project would be for the semester. 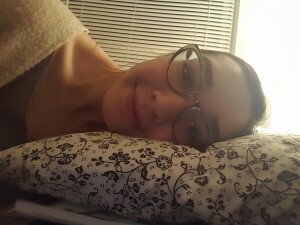 After diligently trying to come up with some sort of idea, I realized as I was lying in bed how uncomfortable I was when trying to carefully place my glasses against my pillow. And then the idea for GlassFlex was born. I spoke to Vishal about my idea and he mentioned that people have been finding uses for a flexible filament, but not much experimentation has been made with it. With Harina (a fellow glasses-wearer) joining the team, she was able to do a good amount of research when it came to understanding the variety of different flexible filaments available. The one she concluded would be best for our project was Ninja Flex, which worked out awesome. Elaine (another fellow glasses-wearer) joined the mission and assisted in coming up with some prototype designs. The first design we had created was a simple hot dog-style piece that fit on the brim of your glasses. It was too small, uncomfortable (because we hadn’t ordered the Ninja Flex yet so we used traditional plastic filament), and fell out easily and needed to be held in place. But that’s the beauty of trial and error! The next design we made expanding upon the first one, with the opening having a little slit to keep the edge of the glasses from moving out of place. This was also quite hard and uncomfortable, as we still weren’t able to use the Ninja Flex. Even if we were able to use the flexible filament, we decided to keep expanding upon our models. The third design was the first model we actually made with Ninja Flex. We had also made it taller for comfort, but tried using 20% fill density which was not sufficient enough for the level of comfort we were trying to achieve. So we kept on. The fourth model was made wider instead of thicker, thinking that would be easiest to absorb the pressure from the pillow and keep your glasses in place. However, this was not the case. And it once again became an issue with the fill density. We had avoided increasing the density just because of the time it takes to print a model with anything more than 20% fill density. Printing with flexible material requires slower printing speed as well as a cooler plate temperature. All of these factors simply increased the time it takes to print exponentially. Our fifth and final model we had decided to not only change the design but also increase the density to 50%. This model expanded more so upon our third prototype by fully enclosing the opening at the top so that the user would slide his or her glasses frame through the hole and then use the GlassFlex. This worked tremendously well. The 50% density was able to absorb the pressure from the pillow without shifting your glasses out of place, and the enclosed edge allowed for the piece to not move out of place. This was the most comfortable and successful model we had created. Because of this class, we have been able to expand upon our thought process when it comes to fixing a problem in our every day lives. Through the sessions with Design for America, lessons in the FabLab, and lessons to understand software on how to make and mold products, we have been able to create something beneficial to all glasses wearers. To see our presentation slides, click here. This entry was posted in Portfolio, Reflections by Paige Lee. Bookmark the permalink.